This essay is Part 3 of “Global Power and Global Government,” published by Global Research. In 1954, the Bilderberg Group was founded in the Netherlands, which was a secretive meeting held once a year, drawing roughly 130 of the political-financial-military-academic-media elites from North America and Western Europe as “an informal network of influential people who could consult each other privately and confidentially.” Regular participants include the CEOs or Chairman of some of the largest corporations in the world, oil companies such as Royal Dutch Shell, British Petroleum, and Total SA, as well as various European monarchs, international bankers such as David Rockefeller, major politicians, presidents, prime ministers, and central bankers of the world. Joseph Retinger, the founder of the Bilderberg Group, was also one of the original architects of the European Common Market and a leading intellectual champion of European integration. In 1946, he told the Royal Institute of International Affairs (the British counterpart and sister organization of the Council on Foreign Relations), that Europe needed to create a federal union and for European countries to “relinquish part of their sovereignty.” Retinger was a founder of the European Movement (EM), a lobbying organization dedicated to creating a federal Europe. Retinger secured financial support for the European Movement from powerful US financial interests such as the Council on Foreign Relations and the Rockefellers. However, it is hard to distinguish between the CFR and the Rockefellers, as, especially following World War II, the CFR’s main finances came from the Carnegie Corporation, Ford Foundation and most especially, the Rockefeller Foundation. The Bilderberg Group acts as a “secretive global think-tank,” with an original intent to “to link governments and economies in Europe and North America amid the Cold War.” One of the Bilderberg Group’s main goals was unifying Europe into a European Union. Apart from Retinger, the founder of the Bilderberg Group and the European Movement, another ideological founder of European integration was Jean Monnet, who founded the Action Committee for a United States of Europe, an organization dedicated to promoting European integration, and he was also the major promoter and first president of the European Coal and Steel Community (ECSC), the precursor to the European Common Market. In 1957, two years later, the Treaty of Rome was signed, which created the European Economic Community (EEC), also known as the European Community. Over the decades, various other treaties were signed, and more countries joined the European Community. In 1992, the Maastricht Treaty was signed, which created the European Union and led to the creation of the Euro. The European Monetary Institute was created in 1994, the European Central Bank was founded in 1998, and the Euro was launched in 1999. Etienne Davignon, Chairman of the Bilderberg Group and former EU Commissioner, revealed in March of 2009 that the Euro was debated and planned at Bilderberg conferences. This was an example of regionalism, of integrating an entire region of the world, a whole continent, into a large supranational structure. This was one of the primary functions of the Bilderberg Group, which would also come to play a major part in other international issues. The theoretical justifications for integration and regionalism arrived in the 1960s with what is known as “interdependence theory.” One of its primary proponents was a man named Richard N. Cooper. Two other major proponents of interdependence theory are Robert Keohane and Joseph Nye. Interdependence theory and theorists largely expand upon the notions raised by Keynes. Keohane and Nye also discuss the relevance and importance of international regimes in the politics of interdependence, defining regimes as “networks of rules, norms, and procedures that regularize behavior.” They argue that, “Regimes are affected by the distribution of power among states, but regimes, in turn, may critically influence the bargaining process among states.” Again, this contests the realist and mercantilist notions of the international sphere being one of chaos, as a regime can produce and maintain order within the international arena. Interdependence theorists tend to argue that interdependence has altered the world order in that it has become based upon cooperation and mutual interests, largely championing the liberal economic notion of a non-chaotic and cooperative international order in which all nations seek and gain a mutual benefit. Ultimately, it justifies the continued process of global economic integration, while realist and mercantilist theorists, who interdependence theorists contest and debate, justify the use of force in the international arena in terms of describing it as inherently chaotic. In theory, the notions of mercantilism and liberalism are inimical to one another however, they are not mutually exclusive and are, in fact, mutually reinforcing. Events throughout the 1970s are a clear example of this mutually reinforcing nature of mercantilist behaviour on the part of states, and the “interdependence” of the liberal economic order. As early mercantilist theorist Frederick List wrote in regards to integration and union, “All examples which history can show are those in which the political union has led the way, and the commercial union has followed. Not a single instance can be adduced in which the latter has taken the lead, and the former has grown up from it.” It would appear that the elites have chosen the road less traveled in the 20th century, with the Bilderberg Group pursuing integration and union in Europe by starting with commercial union and having political union follow. This concept is also evident in the notions of interdependence theory, which focuses on global economic integration as changing the realist/mercantilist notions of a chaotic international order, as states and other actors become more cooperative through such economic ties. In the late 1960s, Western European economies (in particular West Germany) and Japan were rapidly developing and expanding. Their currencies rose against the US dollar, which was pegged to the price of gold as a result of the Bretton Woods System, which, through the IMF, set up an international monetary system based upon the US dollar, which was pegged to gold. However, with the growth of West Germany and Japan, “by the late 1960s the system could no longer be expected to perform its previous function as a medium for international exchange, and as a surrogate for gold.” On top of this, to maintain its vast empire, the US had developed a large balance-of-payments deficit. Richard Nixon took decisive, and what many referred to as “protectionist” measures, and in 1971, ended the dollar’s link to gold, which “resulted in a devaluation of the dollar as it began to float against other currencies,” and “was meant to restore the competitiveness of the US economy,” as with devaluation, “U.S.-made goods would cost less to foreigners and foreign-made goods would be less competitive on the U.S. market.” The second major action taken by Nixon was when he “slapped a ten percent surcharge on most imports into the United States,” which was to benefit U.S. manufacturing firms over foreign ones in competition for the U.S. market. The result was that less imports from Asia were coming into the US, more US goods were sold in their markets at more competitive prices, forcing Japan and the European Economic Community (EEC) to relax their trade barriers to US products. There was a consensus within the American ruling class that the Bretton Woods System was in need of a change, but there were divisions among members in how to go about changing it. The more powerful (and wealthy) international wing feared how US policies may isolate and alienate Western Europe and Japan, and they advocated that, “The world economic roles of America must be reconciled with the growth to power of Europe and Japan. There must be fundamental reform of the international monetary system. There must be renewed efforts to reduce world trade barriers. The underlying U.S. balance of payments has deteriorated.” However, Nixon “went much too far” as he alienated Western Europe and Japan. 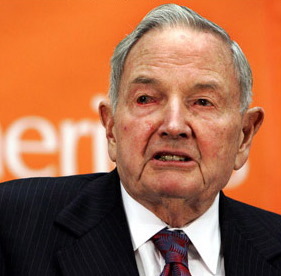 In 1970, David Rockefeller became Chairman of the Council on Foreign Relations, while also being Chairman and CEO of Chase Manhattan. In 1970, an academic who joined the Council on Foreign Relations in 1965 wrote a book called Between Two Ages: America’s Role in the Technetronic Era. The author, Zbigniew Brzezinski, called for the formation of “A Community of the Developed Nations,” consisting of Western Europe, the United States and Japan. Brzezinski wrote about how “the traditional sovereignty of nation states is becoming increasingly unglued as transnational forces such as multinational corporations, banks, and international organizations play a larger and larger role in shaping global politics.” David Rockefeller had taken note of Brzezinski’s writings, and was “getting worried about the deteriorating relations between the U.S., Europe, and Japan,” as a result of Nixon’s economic shocks. In 1972, David Rockefeller and Brzezinski “presented the idea of a trilateral grouping at the annual Bilderberg meeting.” In July of 1972, seventeen powerful people met at David Rockefeller’s estate in New York to plan for the creation of the Commission. Also at the meeting was Brzezinski, McGeorge Bundy, the President of the Ford Foundation, (brother of William Bundy, editor of Foreign Affairs) and Bayless Manning, President of the Council on Foreign Relations. So, in 1973, the Trilateral Commission was formed to address these issues. Interestingly, interdependence theorist Joseph Nye is a member of the Trilateral Commission, as is Richard N. Cooper. Today, Joseph Nye is a member of the Board of Directors of the Council on Foreign Relations, and Richard N. Cooper was a Director of the Council on Foreign Relations from 1993-1994. The end of the link of the dollar to gold meant that, “the US was no longer subject to the discipline of having to try to maintain a fixed par value of the dollar against gold or anything else: it could let the dollar move as the US Treasury [and ultimately, the Federal Reserve] wished and pointed towards the removal of gold from international monetary affairs.” This created a dollar standard, as opposed to a gold standard, which “places the direction of the world monetary policy in the hands of a single country,” which was “not acceptable to Western Europe or Japan.” Addressing this issue was among the reasoning behind the creation of the Trilateral Commission. The May 1973 meeting of the Bilderberg Group occurred five months prior to the extensive oil price rises brought about by the Yom Kippur War. However, according to leaked minutes from the meeting, a 400% increase in the price of oil was discussed, and meeting participants were creating a “plan [on] how to manage the about-to-be-created flood of oil dollars.” Oil is no issue foreign to the interests of the Bilderberg Group, as among the 1973 participants were the CEOs of Royal Dutch Shell, British Petroleum (BP), Total S.A., ENI, Exxon, as well as significant banking interests and individuals such as Baron Edmond de Rothschild and David Rockefeller, and the US Secretary of State at the time, Henry Kissinger. In 1955, Henry Kissinger, a young scholar at the time, was brought into the Council on Foreign Relations, where he distinguished himself as a prominent Council member and became a protégé to Nelson Rockefeller, one of David Rockefeller’s brothers. In 1969, Kissinger became Richard Nixon’s National Security Adviser. This Bilderberg meeting was taking place during a time of great international instability, particularly in the Middle East. At the time of the Yom Kippur War, Nixon was in the middle of major domestic issues, as the Watergate scandal was breaking, leading to an increase in the power and influence of Kissinger, as “The president was deeply preoccupied, and at times incapacitated by self-pity or alcohol.” By 1970, Kissinger had Rogers “frozen out of policy-making on Southeast Asia,” during the Vietnam War, so Rogers “concentrated on the Middle East.” Eventually, Nixon had Rogers resign, and then Henry Kissinger took the position as both National Security Advisor and Secretary of State. On October 4, the US National Security Agency (NSA) “knew beyond a shadow of a doubt that an attack on Israel would take place on the afternoon of October 6.” However, the Nixon White House “ordered the NSA to sit on the information,” until the US warned Israel a few hours before the attack, even though “Nixon’s staff had at least two days’ advance warning that an attack was coming on October 6.” Hours before the attack on Israel by Syria and Egypt, the U.S. warned its Israeli counterparts, however, “the White House insisted that the Israelis do nothing: no preemptive strikes, no firing the first shot. If Israel wanted American support, Kissinger warned, it could not even begin to mobilize until the Arabs invaded.” Israeli Prime Minister Golda Meir stood Israeli defences down, citing “Kissinger’s threats as the major reason.” Interestingly, Kissinger himself was absent from his office on the day of the attack, and he knew days before when it was set to take place, yet, still went to the Waldorf Astoria in New York. Further, he waited three days before convening a U.N. Security Council meeting. The attack needed to go forward, as directed by the backdoor diplomacy of Kissinger. On October 12, the major American oil companies sent a letter to Nixon suggesting the Arab countries “should receive some price increase,” and Nixon, following Kissinger’s advice, sent arms to Israel, which precipitated the Arab OPEC countries to announce a 70% increase in the price of oil on October 16th, and announce an oil embargo against the US on the 17th. As economist F. William Engdahl noted in his book, A Century of War, “One enormous consequence of the ensuing 400 per cent rise in OPEC oil prices was that investments of hundreds of millions of dollars by British Petroleum, Royal Dutch Shell [both present at Bilderberg] and other Anglo-American petroleum concerns in the risky North Sea could produce oil at a profit,” as “the profitability of these new North Sea oilfields was not at all secure until after the OPEC price rises.” In 2001, the former Saudi representative to OPEC, Sheik Ahmed Yamani, said, “’I am 100 per cent sure that the Americans were behind the increase in the price of oil. The oil companies were in real trouble at that time, they had borrowed a lot of money and they needed a high oil price to save them.” When he was sent by King Faisal to the Shah of Iran in 1974, the Shah said that it was Henry Kissinger who wanted a higher price for oil. The summer before the Yom Kippur War, in 1973, James Akins was made U.S. Ambassador to Saudi Arabia. He also happened to be a member of the Council on Foreign Relations. Saudi Arabian minister for petroleum and representative to OPEC, Sheik Ahmed Yamani, stated in February of 1973, that, “it is in the interests of the oil companies that prices be raised,” as “their profits are collected from the production stage.” It was also in the interests of the US, as OPEC will have a massive increase in revenues to be invested, likely in the US, itself. As Peter Gowan stated in The Globalization Gamble, “the oil price rises were the result of US influence on the oil states and they were arranged in part as an exercise in economic statecraft directed against America’s ‘allies’ in Western Europe and Japan. And another dimension of the Nixon administration’s policy on oil price rises was to give a new role, through them, to the US private banks in international financial relations.” He explained that the Nixon administration was pursuing a higher oil price policy two years before the Yom Kippur War, and “as early as 1972 the Nixon administration planned for the US private banks to recycle the petrodollars when OPEC finally did take US advice and jack up oil prices.” Ultimately, the price rises had devastating impacts on Western Europe and Japan, which were quickly growing economies, but which were heavily dependent upon Middle eastern oil. This is an example of how the US, while championing a liberal international economic order, acted in a mercantilist fashion, depriving competitors through improving its own power and influence. In 1973, David Rockefeller set up the Trilateral Commission to promote coordination and cooperation among Japan, Western Europe, and North America (namely, the US), yet, in the same year, his good friend and close confidante, Henry Kissinger, played a key role in promoting and orchestrating the oil price rises that had a damaging impact upon Japan and Western Europe. Also it should be noted, David Rockefeller’s Chase Manhattan Bank, of which he was CEO at the time, profited immensely off of the petrodollar recycling system promoted by Henry Kissinger, where the OPEC countries would reinvest their new excess capital into the American economy through London and New York banks. How does one account for these seemingly diametrically opposed initiatives? Perhaps the oil crisis, having a negative effect on Japan and Western European economies, could have spurred the necessity for cooperation among the trilateral countries, forcing them to come together and coordinate future policies. It is of vital importance to understand the global conditions in which the price rises and its solutions arose, particularly in relation to the Third World. Africa, since the late 1800s, had been under European colonial control. It was from the 1950s to the 1960s that almost all African countries were granted independence from their European metropoles. Africa is a very significant case to look at, as it is extremely rich in many resources, from agriculture to oil, minerals, and a huge variety of other resources used all around the world. If African nations were able to develop their own economies, use their own resources, and create their own industries and businesses, they could become self-sufficient at first, and then may become a force of great competition for the established industries and elites around the world. After all, Europe does not have much to offer in terms of resources, as the continent’s wealth has largely come from plundering the resources of regions like Africa, and in becoming captains of monetary manipulation. A revitalized, vibrant, economically independent and successful Africa could spell the end of Western financial dominance. “Between 1960 and 1975 African industry grew at the annual rate of 7.5 per cent. This compared favourably with the 7.2 per cent for Latin America and 7.5 per cent for South-East Asia.” In Africa, “the 1960-73 period witnessed some important first steps in the process of industrialization,” however, “[t]he dramatic decline in rates of industrialization began to show after the first ‘oil crisis’. Between 1973 and 1984, the rate of growth” rapidly declined. So, by manipulating the price of oil, you can manipulate the development of the Third World, which was beginning to look as if it could grow into significant competition, as it was experiencing exponential growth. There were two oil shocks in the 1970s; one in 1973 and another in 1979. Following the price rises, there was a need for the developing countries of the world to borrow money to finance development. Of great significance was that, “the new international monetary arrangements gave the United States government far more influence over the international monetary and financial relations of the world than it had enjoyed under the Bretton Woods system. It could freely decide the price of the dollar. And states would become increasingly dependent upon developments in Anglo-American financial markets for managing their international monetary relations. And trends in these financial markets could be shifted by the actions (and words) of the US public authorities, in the Treasury Department and the Federal Reserve Board (the US Central Bank).” This new system is referred to as the Dollar-Wall Street Regime (DWSR), as it is dependent upon the US dollar and the key actors on Wall Street. The Federal Reserve’s response to the initial 1973-74 oil price shock was to keep interest rates low, which led to inflation and a devalued dollar. It’s also what allowed and encouraged banks to lend massive amounts to developing countries, often lending more than their net worth. However, in 1979, with the second oil shock, the Federal Reserve changed policy, and the true nature of the original oil crisis, petrodollar recycling and loans became apparent. On September 11, 1973, General Augusto Pinochet orchestrated a coup d’état, with the aid and participation of the CIA, against the Allende government of Chile, overthrowing it and installing Pinochet as dictator. The next day, an economic plan for the country was on the desks of “the General Officers of the Armed Forces who performed government duties.” The plan entailed “privatization, deregulation and cuts to social spending,” written up by “U.S.-trained economists.” These were the essential concepts in neoliberal thought, which, through the oil crises of the 1970s, would be forced upon the developing world through the World Bank and IMF. In essence, Chile was the neo-liberal Petri-dish experiment. This was to expand drastically and become the very substance of the international economic order. Globalization: A Liberal-Mercantilist Economic Order? In 1971, Jimmy Carter, a somewhat obscure governor from Georgia had started to have meetings with David Rockefeller. They became connected due to Carter’s support from the Atlanta corporate elite, who had extensive ties to the Rockefellers. So in 1973, when David Rockefeller and Zbigniew Brzezinski were picking people to join the Trilateral Commission, Carter was selected for membership. Carter thus attended every meeting, and even paid for his trip to the 1976 meeting in Japan with his campaign funds, as he was running for president at the time. Brzezinski was Carter’s closest adviser, writing Carter’s major campaign speeches. When Jimmy Carter became President, he appointed over two-dozen members of the Trilateral Commission to key positions in his cabinet, among them, Zbigniew Brzezinski, who became National Security Adviser; Samuel P. Huntington, Coordinator of National Security and Deputy to Brzezinski; Harold Brown, Secretary of Defense; Warren Christopher, Deputy Secretary of State; Walter Mondale, Vice President; Cyrus Vance, Secretary of State; and in 1979, he appointed David Rockefeller’s friend, Paul Volcker, as Chairman of the Federal Reserve Board. In 1979, the Iranian Revolution spurred another massive increase in the price of oil. The Western nations, particularly the United States, had put a freeze on Iranian assets, “effectively restricting the access of Iran to the global oil market, the Iranian assets freeze became a major factor in the huge oil price increases of 1979 and 1981.” Added to this, in 1979, British Petroleum cancelled major oil contracts for oil supply, which along with cancellations taken by Royal Dutch Shell, drove the price of oil up higher. Volcker got his start as a staff economist at the New York Federal Reserve Bank in the early 50s. After five years there, “David Rockefeller’s Chase Bank lured him away.” So in 1957, Volcker went to work at Chase, where Rockefeller “recruited him as his special assistant on a congressional commission on money and credit in America and for help, later, on an advisory commission to the Treasury Department.” In the early 60s, Volcker went to work in the Treasury Department, and returned to Chase in 1965 “as an aide to Rockefeller, this time as vice president dealing with international business.” With Nixon entering the White House, Volcker got the third highest job in the Treasury Department. This put him at the center of the decision making process behind the dissolution of the Bretton Woods agreement. In 1973, Volcker became a member of Rockefeller’s Trilateral Commission. In 1975, he got the job as President of the New York Federal Reserve Bank, the most powerful of the 12 branches of the Fed. In 1979, Carter gave the job of Treasury Secretary to Arthur Miller, who had been Chairman of the Fed. This left an opening at the Fed, which was initially offered by Carter to David Rockefeller, who declined, and then to A.W. Clausen, Chairman of Bank of America, who also declined. Carter repeatedly tried to get Rockefeller to accept, and ultimately Rockefeller recommended Volcker for the job. Volcker became Chairman of the Federal Reserve System, and immediately took drastic action to fight inflation by radically increasing interest rates. The world was taken by shock. This was not a policy that would only be felt in the US with a recession, but was to send shock waves around the world, devastating the Third World debtor nations. This was likely the ultimate aim of the 1970s oil shocks and the 1979 Federal Reserve shock therapy. With the raising of interest rates, the cost of international money also rose. Thus, the interest rates on international loans made throughout the 1970s rose from 2% in the 1970s to 18% in the 1980s, dramatically increasing the interest charges on loans to developing countries. The IMF and World Bank entered the scene newly refurnished with a whole new outlook and policy program designed just in time for the arrival of the debt crisis. The IMF “negotiated standby loans with debtors offering temporary assistance to states in need. In return for the loans states agreed to undertake structural adjustment programs (SAPs). These programs entailed the liberalization of economies to trade and foreign investment as well as the reduction of state subsidies and bureaucracies to balance national budgets.” Thus, the neoliberal project of 1973 in Chile was expanded into the very functioning of the International Financial Institutions (IFIs). “The phrase ‘Washington Consensus’ was coined to capture the agreement upon economic policy that was shared between the two major international financial institutions in Washington (IMF and World Bank) and the US government itself. This consensus stipulated that the best path to economic development was through financial and trade liberalization and that international institutions should persuade countries to adopt such measures as quickly as possible.” The debt crisis provided the perfect opportunity to quickly impose these conditions upon countries that were not in a position to negotiate and with no time to spare, desperately in need of loans. Without the debt crisis, such policies may have been subject to greater scrutiny, and with a case-by-case analysis of countries adopting SAPs, the world would become quickly aware of their dangerous implications. The debt crisis was absolutely necessary in implementing the SAPs on an international scale in a short amount of time. The effect became quite clear, as the result “of these policies on the population of developing countries was devastating. The 1980s is known as the ‘lost decade’ of development. Many developing countries’ economies were smaller and poorer in 1990 than in 1980. Over the 1980s and 1990s, debt in many developing countries was so great that governments had few resources to spend on social services and development.” With the debt crisis, countries in the developing world were “[s]tarved of international finance, [and] states had little choice but to open their economies to foreign investors and trade.” The “Third World” was recaptured in the cold grasp of economic colonialism under the auspices of neo-liberal economic theory. Since the 1970s, mercantilist thought had re-emerged in mainstream political-economic theory. Under various names such as neo-mercantilism, economic nationalism or statism, they hold as vital the centrality of the state in the global political economy. Much “Globalization” literature puts an emphasis on the “decline of the state” in the face of an integrated international economic order, where borders are made illusory. However, statist theory at least helps us understand that the state is still a vital factor within the global political economy, even in the midst of a neo-liberal economic order. Within the neo-liberal economic order, it was the powerful western (primarily US and Western European) states that imposed neo-mercantilist or statist policies in order to protect and promote their interests within the global political economy. Some of these methods were revolved around policy tools such as export subsidies, imposed to lower the price of goods, which would make them more attractive to importers, giving that particular nation an advantage over the competition. For example, the US has enormous agriculture export subsidies, which make US agriculture and grain an easily affordable, attractive and accessible commodity for importing nations. Countries of the global south (the Lesser-Developed Countries, LDCs), subject to neo-liberal policies imposed upon them by the World Bank and IMF were forced to open their economies up to foreign capital. The World Bank would bring in heavily subsidized US grain to these poor nations under the guise of “food aid,” which would have the affect of destabilizing the nation’s agriculture market, as the heavily subsidized US grains would be cheaper than local produce, putting farmers out of business. Most LDCs are predominantly rural based, so when the farming sector is devastated, so too is the entire nation. They plunge into economic crisis and even famine. With the statist approach, theorists examine how the state is still relevant in shaping economic outcomes and still remains a powerful entity in the international arena. One theorist who is prominent within the statist school is Robert Gilpin. Gilpin, a professor at the Woodrow Wilson School of Public and International Affairs at Princeton, is also a member of the Council on Foreign Relations. In his book, Global Political Economy, Gilpin postulated that multinational corporations were an invention of the United States, and indeed an “American phenomenon” upon which European and Asian states responded by internationalizing their own firms. In this sense, his theory postulated to a return to the competitive nature of mercantilist economic theory, in which one state gains at the expense of another. He also addresses the nature of the international economy, in that both historically and presently, there was a single state acting as the main enforcer and manager of the global economy. Historically, it was Britain, and presently, it was the United States. One cannot deny the significance of the state in the global political economy, as it has been, and still remains very relevant. The events of 1973 are exemplary of this, however, more must be examined in order to better understand the situation. Though states are still prominent actors, it is vital to address in whose interest they act. Mercantilist and statist theorists tend to focus on the concept that states act in their own selfish interest, for the benefit of the state, both politically and economically. However, this is somewhat linear and diversionary, as it does not address the precise structure of the state economy, specifically in terms of its monetary and central banking system. States, most especially the large hegemonic ones, such as the United States and Great Britain, are controlled by the international central banking system, working through secret agreements at the Bank for International Settlements (BIS), and operating through national central banks (such as the Bank of England and the Federal Reserve). The state is thus owned by an international banking cartel, and though the state acts in such a way that proves its continual relevance in the global economy, it acts so not in terms of self-interest for the state itself, but for the powerful interests that control that state. The same international banking cartel that controls the United States today previously controlled Great Britain and held it up as the international hegemon. When the British order faded, and was replaced by the United States, the US ran the global economy. However, the same interests are served. States will be used and discarded at will by the international banking cartel; they are simply tools. However, Gilpin explains that the “Creation of effective international regimes and solutions to the compliance problem require both strong international leadership and an effective international governance structure.” Yet, he explains, “Regimes in themselves cannot provide governance structure because they lack the most critical component of governance – the power to enforce compliance. Regimes must rest instead on a political base established through leadership and cooperation.” This is where we see the emergence of Hegemonic Stability Theory. The roots of Hegemonic Stability Theory (HST) lie within both liberal and statist theory, as it is representative of a crossover theory that cannot be so easily placed in either category. The main concept champions the liberal notion of the open international economic system, guided by liberal principles of open-markets and free trade, while bringing in the statist concept of a single hegemonic state representing the concentration of political and economic power, as it is the enforcer of the liberal international economy. The more liberal-leaning theorists of HST argue that a liberal economic order requires a strong, hegemonic state to maintain the smooth functioning of the international economy. One thing this state must do is maintain the international monetary system, as Britain did under the gold standard and the United States did under the Dollar-Wall Street Regime, following the end of the Bretton-Woods dollar-gold link. Regime Theory is another crossover theory between liberal and mercantilist theorists. Its rise was primarily in reaction to the emergence of Hegemonic Stability Theory, in order to address the concern of a perceived decline in the power of the US. This was due to the rise of new economic powers in the 1970s, and another major purveyor of this theory was Robert Keohane. They needed to address how the international order could be maintained as the hegemonic power declined. The answer was in the building of international organizations to manage the international regime. In this sense, Regime Theory has identified an important aspect of the global political economy, in that though states have upheld the international order in the past, never before has there been such an undertaking to institutionalize the authority over the international order through international organizations. These organizations, such as the World Bank, IMF, UN, and WTO, though still controlled and influenced by states, predominantly the international hegemon, the United States, represent a changing direction of internationalization and transnationalism. Regime Theorists tend to justify the formation of a more transnational apparatus of power, beyond just a single hegemonic state, into a more internationalized structure of authority.